justthefood.com...the blog: A Family Tradition of Sauerkraut and Dumplings to Ring in the New Year! In a large pot, with a tight fitting lid, add vegetable broth and sauerkraut and bring to a boil. Reduce to a simmer and add in TVP or Soy Curls. To make the Dumplin’s: In a large mixing bowl combine flour, baking powder, baking soda, and salt. In a separate small bowl combine soy milk and lemon juice. It will curdle and become like buttermilk. Add melted butter to the buttermilk mixture and stir to combine. Add wet to dry and mix to combine. Some lumps are okay. The batter will be wet, like a very thick pancake batter. Using an ice-cream scoop, carefully drop the dumplin’s into the simmering sauerkraut. Repeat until all of the batter is used and the dough balls almost create a solid layer on top of the sauerkraut. Cover and cook for about 30 minutes, or until doughballs are fully cooked. They will still look moist on the outside, but the insides should be fluffy. Scoop a doughball into a bowl and ladle with the sauerkraut. *You can use any of your favorite proteins here…Gardein, Beyond Meat Strips, Seitan, Tempeh, even Tofurkey Sandwich slices! 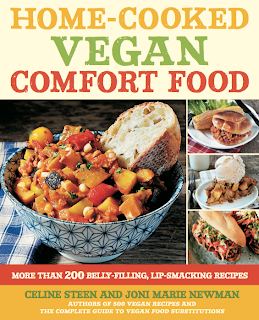 which has since been rerelased as Home-Cooked Vegan Comfort Food. It appears on page 131. Sauerkraut wasn't super popular in England, so its never been one of my favs. But the dumplings sound good, so I will definitely give those a try. 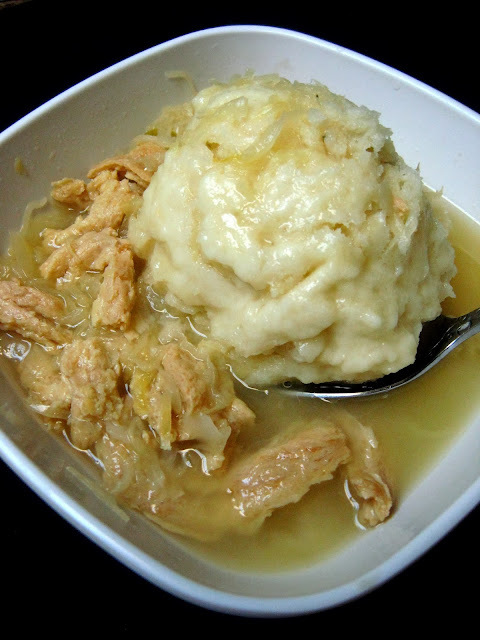 I think if you leave the sauerkraut out, and replace it with vegetable, like peas, carrots, maybe even potatoes, you will have a very nice "Chicken and Dumplings" type dish! That sounds delicious! I've never heard of such a dish!! I miss dumplings! Do you think it's possible to make them without the "butter"? It is good, and super easy too. I am so glad I made a full batch yeaterday, because the leftovers really hit the spot tonight! Sure, just use any mild flavored vegetable oil. If you are following a no oil diet, you can just use extra nondairy milk, but they do taste better with the added fat. I just made this today and FABULOUS! Got some delicious sauerkraut and added Beyond Meat strips. The dumplings were out of this world. Thanks for such a super recipe! Joni, just saying, this is my new favorite site. Awesome recipes and ideas and totally fits our family's need for varied cuisines. Can't wait to try everything out.